The Task-Enabling™ Exercise (TEE) is a reflective process that makes task-enabling, or helping, more visible, intentional, and impactful for you and others. After you reflect on a specific experience of task-enabling and how it was effective or ineffective, the TEE guides you through the process of identifying task-enabling patterns and devising an action plan to make task-enabling an intentional habit. 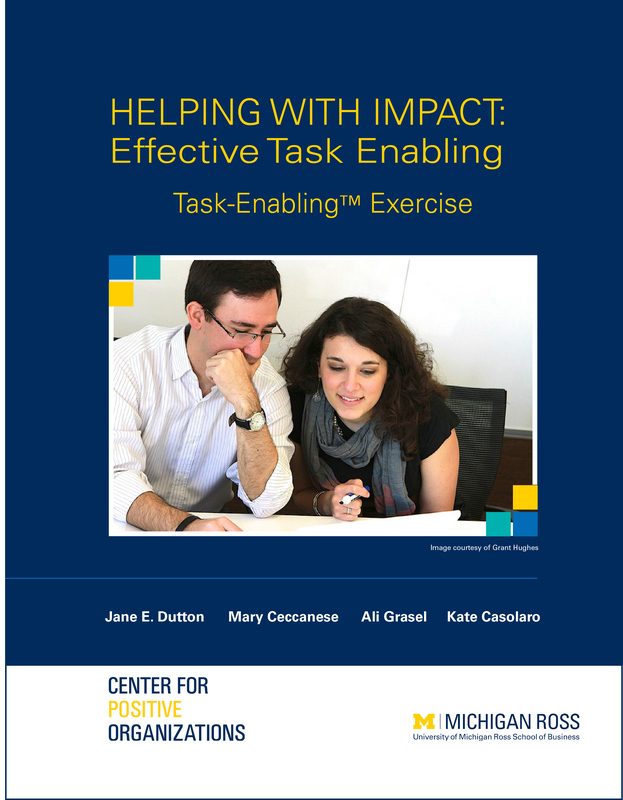 To request a teaching note or preview copy of the Task-Enabling™ Exercise, please email pos-tools@umich.edu. To purchase the TEE , please click the “purchase” link to the left. Classroom exercise: Instructors use the TEE to assist their students in building high-quality connections and enhancing team performance. One-on-one coaching: Coaches use the TEE to guide clients on how to be healthier and more effective by understanding how to encourage and facilitate better task-enabling. Group workshops: Organizations invite employees to participate in the TEE to increase effectiveness of helping and being helped and to foster employee development, growth, and thriving. Self-development: Individuals use the TEE to enable themselves to more effectively help and be helped. Dutton, Jane. Energize Your Workplace. San Francisco: Jossey-Bass, 2003. Print.